The PE and Sport Premium is funding provided to schools in addition to main school funding. This funding is ring-fenced and therefore can only be spent on the provision of PE and sport in schools. Schools receive PE and Sport Premium funding based on the number of pupils in Years 1 to 6. Funding for schools is calculated by reference to the number of primary-aged pupils (between the ages of 5 and 11), as recorded in the annual schools census each January. 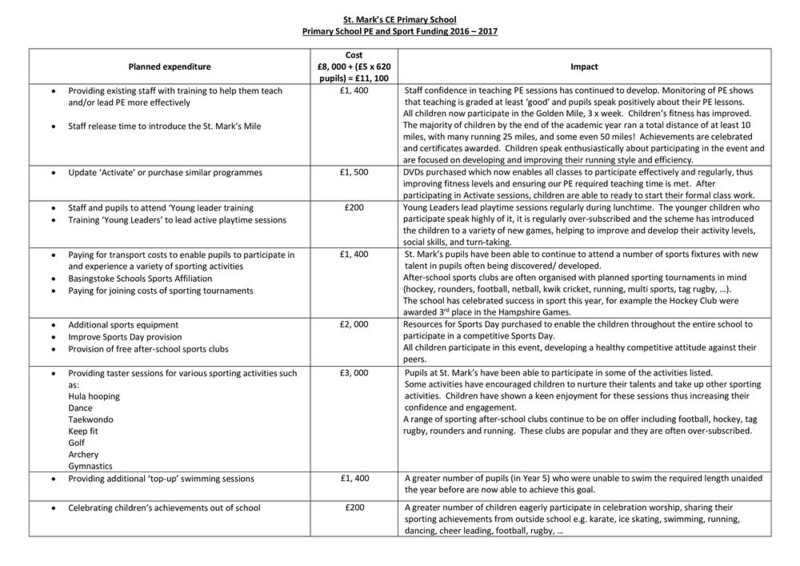 It is for schools to decide how the PE and Sport funding is spent, since they are best placed to assess what additional provision should be made to enhance the provision for PE in school. Schools are to be held accountable for how they have used the additional funding, ensuring additional and sustainable improvements are made to the quality of PE and sport they offer. The links below show how the funding was spent last academic year and how we plan to spend the funding this year. Develop staff CPD of NQTs through the focused PECS programme. Each staff member will have this opportunity for at least 6 weeks across the year. Enable a wide provision of after-school sports clubs to be offered and continue participation in a range of inter school competitions. Increase lunch time sports provision. Develop table tennis as a regular sporting option in our school. The total amount of funding is £22,300. Develop staff CPD through the focused PECS programme. Each staff member will have this opportunity for at least 6 weeks across the year. Most of our sports premium has been used to fund PECS training for each staff member across the school this year. PECS (PE Curriculum Support programme) has been provided by our selected sports provider, Planet Education, to increase skill and confidence specific to each teacher’s own needs. The funding allowed for the Planet Education mentors to be in school with us each afternoon of every week. Most teachers have worked alongside the PECS mentors for at least 12 weeks, covering a range of training and development opportunities including demonstrating and teaching good practice, employing proven planning and assessment methods, and coaching specific skills that teachers may not feel as confident in teaching. After each unit of PECS, teachers are asked to review the impact of their mentoring. According to the data collected from staff questionnaires, this has had a significantly positive impact on teachers’ confidence and ability on all aspects of teaching PE. Enable a wide provision of after-school sports clubs to be offered and continue participation in a range of inter-school competitions. The Sports Premium has also been used to fund even more clubs this year, as well to provide cover to enable teachers to run sports-based clubs and tournaments for the pupils. Through the funding, children have had the opportunity to access a range of sports clubs after school every day this year. Our sports clubs (provided by Planet Education and school staff) have included: Hockey, Multi-activity, Dodgeball, Girls’ Football, Tennis, Netball, Football, Tag Rugby, Rounders, Athletics, Boxer-cise, Cricket, Gymnastics and Racket Skills. Many clubs have run multiple times. Percentage of children who attended at least 1 sports after-school club = 80% (49% last year). This is a significant improvement on our previous years due to the extra clubs that have been provided by Planet Education. This year, the school has taken part in a variety of competitions again including Athletics, Tag Rugby, Football and Cricket. Our most successful tournament was Hockey which our A and B teams went to every month and finished third out of twenty schools. We also have 2 boys who have been selected to attend trials for the Basingstoke District Under-11 Football team aiming to follow on from the successes of one of our pupils from last year. Our Sports Premium Funding has also been used to fund lunchtime clubs provided by Planet Education each day. This has included a range of sports both on the playground and on the field aimed at either Key Stage 1 or 2. Percentage of children who attended at least 1 sports lunch time club = 43%. This the first year lunch time clubs have been running and the impact has been incredibly positive. Children have commented on their keenness to attend, their enjoyment for the range of activities provided and how it lowers any anxieties of having nobody to play with. Planet Education also delivered a Sports Leaders training programme for a group of Year 5 children for 12 weeks. They will continue to use their training next year to provide play opportunities for the younger children as our school ‘Play Leaders’. The Sports Premium funding has also been used to buy new much-needed equipment vital for PE lessons as well as resources for our new style Sports Day which involved all children in much more activity. We have spent above our allocation of Sports Premium money to ensure PE provision meets its full potential. PDF Version of table above.